It is the second week of filming for "Love and Other Troubles" and updates about the film surface eveyday. This time a finnish site called www.abounderrattelser.fi posted a new article for the movie accompanied with a new photo from the set (you can see it on the left). It is taken from the same place the last photo was taken. 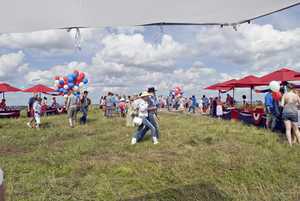 According to some information this is the set for a "summer party scene" with pony rides and line dancing performances. In the same article, you can also read an Emilie's statement about the movie. It is in finnish so i translated it for you: "Playing in a bilingual film is interesting because it opens the door to new types of comedy." Let's hope that Emilie gives a full interview soon! http://suomenkuvalehti.fi/kuvat/?q=Emilie+de+Ravin - ok, now The link worked! Enjoy! Thank you very much for the photos and the updates!!!! Emilie Ville and Jussi look great! This is the first project Emilie will have the opportunity to dance (she is an ex ballerina), so you can't imagine how excited her fans are for this!